The Secular Contract seeks to defend the European Enlightenment's secularization of political philosophy by promoting an understanding of Enlightenment secular liberalism and extending it to contemporary issues.The work proposes that the Enlightenment united the secularizing trends that occurred at the time across all areas of knowledge into a "secular contract" for modern politics. It argues that this was a normatively valuable enterprise whose aims and arguments need to be recovered today, especially in light of the challenges faced by the West, including fundamentalist Christianity in the US and radical Islam in Europe.Looking at the works of many thinkers, such as Hobbes, Jefferson, Madison, Rousseau, the book then shifts to the present day to argue for a different liberalism, as suggested by such contemporary thinkers as William Galston or Stephen Macedo. 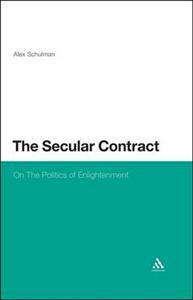 An engaging read, The Secular Contract will appeal to anyone interested in political theory and the history of ideas.